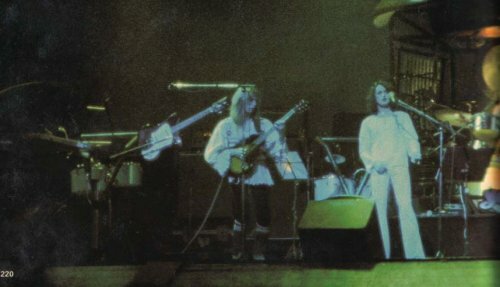 A disturbing night for a Yes fan at London's Rainbow, when the group unveiled their new work "Tales from Topographic Oceans." For despite the applause that followe,despite the laudatory cries of "fantastic" from those around me, my own feelings were of having been drowned in the Topographic Ocean. The work, in four sections was bold, inventive,overpowering. And instead of being the climax of years of work, struggle and evolution, it seemed to strike at the very foundation of the Yes ethos. The beauty of the band's music has always been their ability to embellish and enhance a theme or melody. 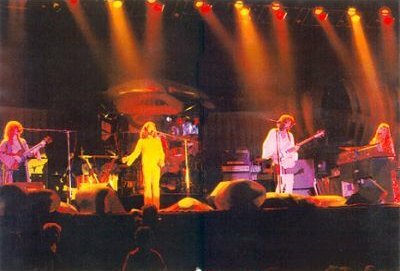 In their day, Yes were revolutionary among groups, bringing new standards of musicianship and taste to the scene. But the new music gave the impression, at least of being one long embellishment, with no other foundation. A series of meticulously rehearsed sections assembled and dovetailed together. It was like playing by the numbers. The end result may have been superficially impressive. And certainly the band played a difficult score with expertise. But where was the sparkling individuality of the players? Rick Wakeman for example hardly took a solo throughout the evening and was restricted to endless and somewhat tedious Moog backups. And yet he is a brilliant and entertaining musician, one of the stars of the band, and a delight to hear on piano or organ. 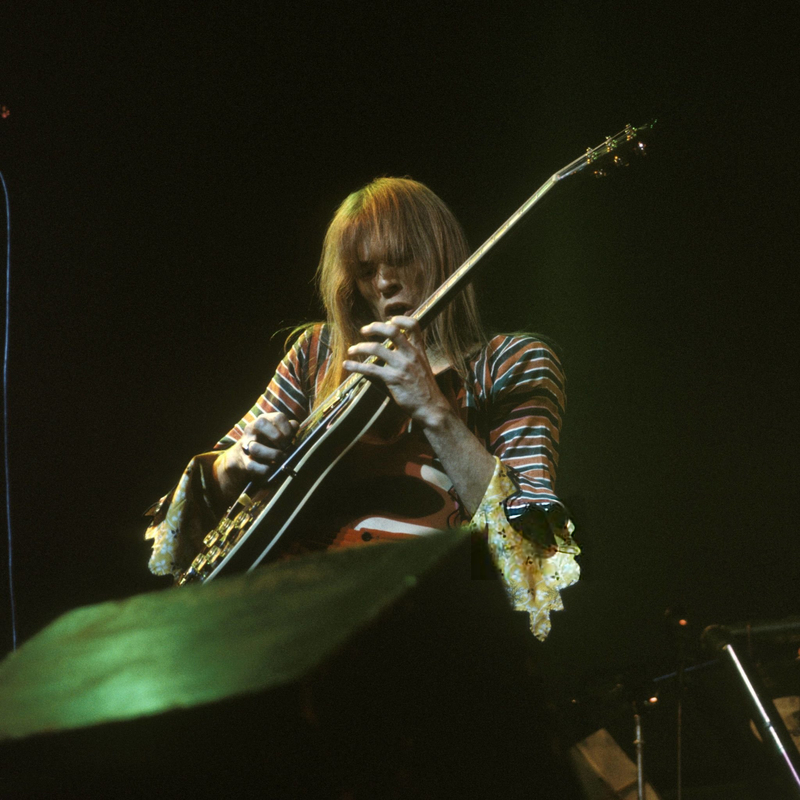 Steve Howe took the bulk of the solos, and yet his acoustic playing seemed much less positive and was even erratic at times. Alan White drummed with great power and precision from his elaborate rostrum, hammering at his snare, but when it came to his solo, this was intruded upon by Jon Anderson, Chris Squire and Steve in a percussion chorus, beating cymbals and timpani, an effect that didn't really suit them. The first number, "And You And I" was fine, and "Close to the Edge" which completed the first half, was a new and improved version. The second, devoted to the new material consisted of one hour and 23 minutes of virtually non stop music. It took a long time before I could admit to myself that I was bored. The endless changes of direction, and the adherence to a strictly rehearsed format meant there was little human expression beyond Jon's own voice. When they played an encore of "Roundabout" it was like a different group. They suddenly came alive, and although it was too late to dispel the gloom completely, it served to remind that Yes are still one of the greatest groups in the world. It is well to remember though that "Topographic" is only one piece of music, just as "Passion Play" was only one string to the Jethro Tull bow. Despite the vast amounts of work and faith pinned on Yes' marathon, it is by no means the last word. Chanting voices lead us into The Revealing Science of God and the marathon Yes epic that has occupied so much of their time throughout the summer and autumn months. Was it all worth it? Even after hearing the concert and playing the four sides of the album several times, it still somehow fails to make impact as an entity. It is a fragmented masterpiece, assembled with loving care and long hours in the studio. Brilliant in patches, but often taking far too long to make its various points, and curiously lacking in warmth or personal expression. 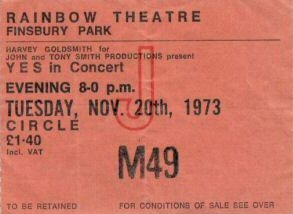 Certainly with repeated listenings, some of the themes have more appeal and are perhaps more memorable than was first supposed from exposure to the work at the Rainbow concert. Certainly all the band played flat out whether on the floating dream like moments of The Remembering which takes up side two, or on the violence of The Ritual. The full gamut of Yes instrumentation is brought into play, in a call and response with Jon Anderson and Steve Howe's lyrics, as memories of Mankind and religion are evoked in dramatic fantasy. A lot of the time the music resembles themes from some great motion picture epic like Exodus or Ben Hur, particularly in the closing moments of The Remembering. The Ancient opens side three with a bubbling, mechanical percussive theme, cleverly conceived with sharp staccato barks from the bass guitar and drums while the guitar howls insistently. More violent, percussive themes are knitted together with wailing from the abyss. Some of the changes here are riveting, but Steve's long guitar howling becomes distinctly boring, until welcome relief comes with some acoustic guitar, although none of this relates to anything that has gone before, and seems to consist of the remnants of past ideas. The use of harmonics here seems quite pointless in the context. Ritual is a dance of celebration and brings the first enjoyable moments, where Alan's driving drums have something to grip on to and the lyrics of la la la speak volumes. But even this cannot last long and cohesion is lost once more to the gods of drab self indulgence. What surprises me is the constant emphasis on the guitar, while the keyboards tend to be relegated to offering back up Mellotron or Moog chords. This is particularly noticeable on the middle section of Ritual while Jon wends through endless lyrics. More percussion noises are interjected before Chris Squire steps in and commences the bass guitar solo that so enlivened the concerts. For the first time the band begins to gel and play. Not for long however. Next comes Alan's drum foray, which is powerful and overladen with some interestingly placed cymbal coughs and pure sound effects. But again, Alan cannot put his own personality into the drum solo. If this review sounds like a series of carping complaints in the face of marvellous musicianship and obvious sincerity I can only say that the music is more of a worry and test of endurance than a transport to delight. But doubtless Topographic will give many pleasure, and the band should be congratulated on setting themselves high standards. I just wish they'd make it easy on themselves. The strain is becoming unbearable. I have now reached that grand old age of 40 and still in love with the most of the music that came out of the 70's Bad Co., The Who, Family, Humble Pie but most of all YES. 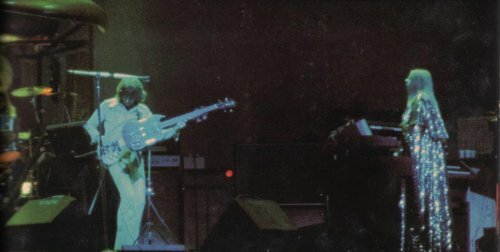 They had been my favourite band since the Yes Album but I never got to see them live until they PREVIEWED TALES FROM TOPOGRAPHIC OCEANS at the old Rainbow Theatre over 7 nights, I did all 7 of those nights and it was interesting to watch them get tighter and tighter as the week drew on. LONDON-- The new Yes album became the first LP in Britain to ship gold on Monday under regulations introduced by BPI on April 1. 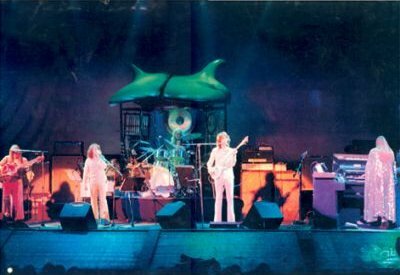 The album -- 'Tales From Topographic Oceans' on Atlantic -- sold $375,000 in records and tapes at dealer price, less tax, before a single copy crossed the retailers' counter to the public. Yes are currently touring Britain playing a set that mainly comprises material from 'Tales From Topographic Oceans.' 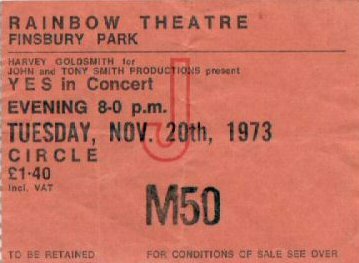 They recently sold out five consecutive nights at London's Rainbow.